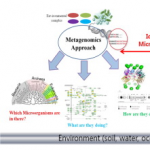 New papers on microbiology of the built environment, July 31, 2016 – microBEnet: the microbiology of the Built Environment network. 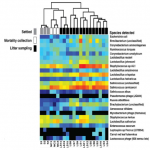 Microbial relative abundance in aerosolized or settled poultry dust. Chronic inhalation exposure to agricultural dust promotes the development of chronic respiratory diseases among poultry workers. Poultry dust is composed of dander, chicken feed, litter bedding and microbes. 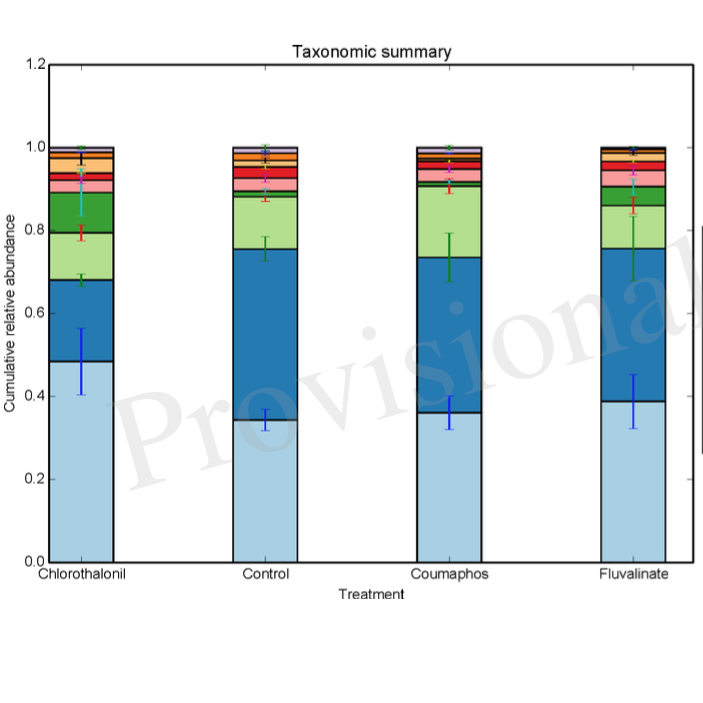 However, the microbial composition and abundance has not been fully elucidated. Genomic DNA was extracted from settled dust and personal inhalable dust collected while performing litter sampling or mortality collection tasks. (…) Unlike settled dust composition, aerosolized dust composition had little variance between samples. These data provide an extensive analysis of the microbial composition and relative abundance in personal inhalable poultry dust and settled poultry dust. Camilla investigated how microorganisms are transferred from surface to surface and person to person. The Luxembourg Institute of Science and Technology (LIST) congratulates Camilla Hurst, a young Luxembourg student from the European School on winning the Charpak medal (the Nobel Prize in Physics 1992) on Friday 15 July, during her participation at the Expo-Sciences Europe in Toulouse (FR). (…) she was awarded the Charpak medal in recognition of her project “What do we bring home from school?” on which the 15-year-old student had been working for two years. She examined the presence of bacteria in her school, population density and type. 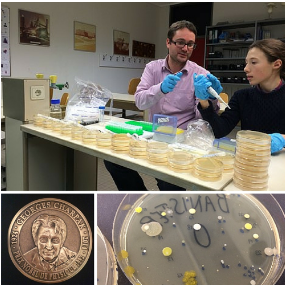 Supported by LIST experts, Camilla identified the DNA of an unknown bacterium, probably discovering a new strain! She also developed protocols designed to reduce the number of bacteria in public places and their spread. Two clusters of Legionnaires’ disease occurred in Flint, MI, subsequent to switching to a corrosive potable water source from April 2014 to October 2015. We hypothesized that the interrupted corrosion control and associated release of iron, nutrients, and depleted chlorine residual in the distribution system would lead to high levels of Legionella. A tap water survey conducted throughout Flint in August and October 2015 confirmed Legionella pneumophila in two hospitals (…), but not small single-story buildings. 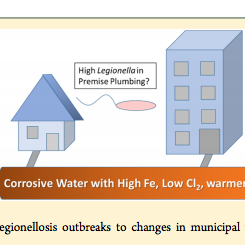 (…) This study addresses knowledge gaps linking legionellosis outbreaks to changes in municipal water quality and distribution system operation. 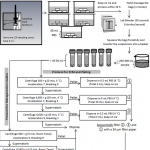 This work aimed to assess at pilot scale the effect of chlorination and water flushing on two-month-old drinking water biofilms and, above all, on biofilm-associated F-specific RNA bacteriophages MS2, GA and QÎ². 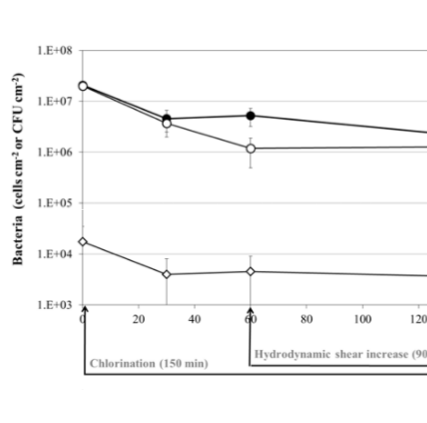 (…) The effect of chlorine on biofilm bacteria and biofilm-associated phages was limited to the upper layers of the biofilm and was not enhanced by an increase in hydrodynamic shear stress. A smaller decrease was observed for MS2 than for GA or QÎ² after completion of the cleaning procedure. 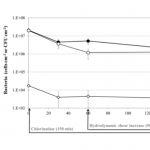 The differences observed between the three phages suggest that the location of the viral particles in the biofilm, which is related to their surface properties, affects the efficiency of chlorine disinfection. 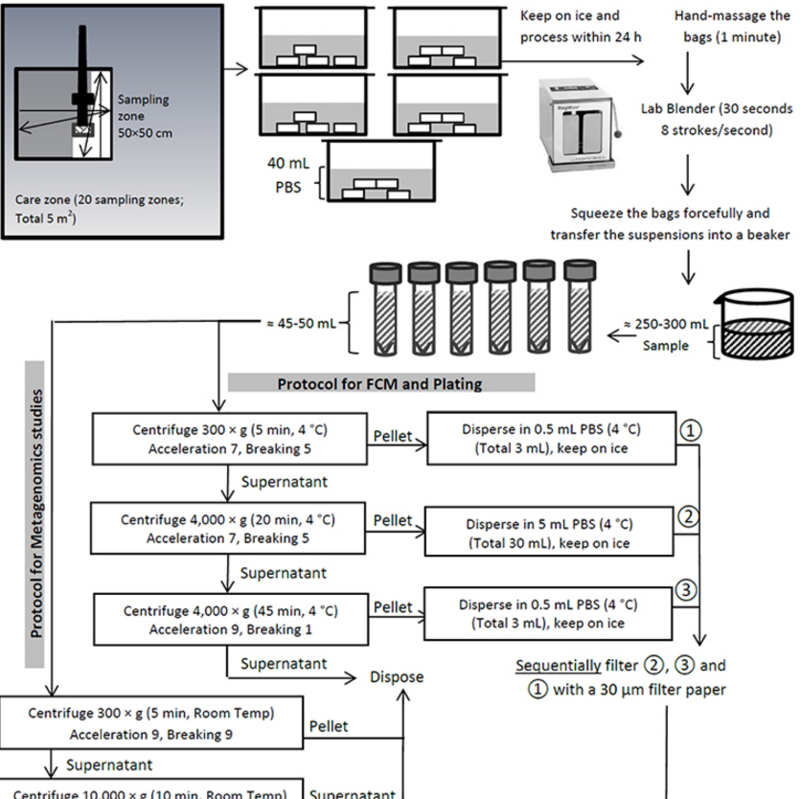 The aim of this study was to develop appropriate protocols for flow cytometric (FCM) and 16S rDNA sequencing investigation of the microbiome in a powdered infant formula (PIF) production facility. Twenty swabs were collected from each of the three care zones of a PIF production facility and used for preparing composite samples. (…) Compared to the dry low and high care zones, the wet medium care zone contained a greater number of viable, culturable, and metabolically active cells. Viable but non-culturable cells were also detected in dry-care zones. In total, 243 genera were detected in the facility of which 42 were found in all three care zones. 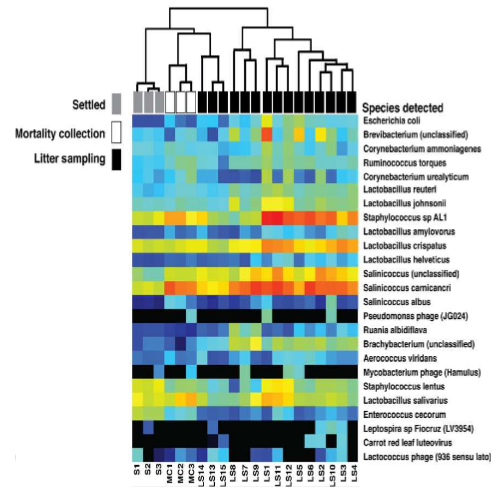 (…) The integration of FCM and metagenomic data provided further information on the density of different species in the facility. Honey bees (Apis mellifera) are the primary pollinators of major horticultural crops. (…) The primary objective of this study was to determine the microbiome associated with honey bees exposed to commonly used in-hive pesticides: coumaphos, tau-fluvalinate and chlorothalonil. Treatments were replicated at three independent locations near Blacksburg Virginia, and included a no-pesticide amended control at each location. (…) The Multi-response permutation procedures (MRPP) and subsequent Phylogenetic Investigation of Communities by Reconstruction of Unobserved States (PICRUSt) analysis indicated that chlorothalonil caused significant change to the structure and functional potential of the honey bee gut bacterial community relative to control. (…) The results of this field-based study suggest the potential for pesticide induced changes to the honey bee gut microbiome that warrant further investigation. One quick suggestion. I would recommend making the title longer and including “on microbiology of the built environment” or such so that when people click “Post to Twitter” or other sharing systems (including our automated one) people know what this is about. Sure, that’s an easy fix! I will try to relabel the older posts, too. Thanks for the suggestion!